BOISE, Idaho -- Environmentalists, farmers and irrigators could play a bigger role in creating long-term management policies for Columbia Basin salmon and steelhead. The government has asked two university programs in Oregon and Washington to act as mediators over the next six months, talking with more than 200 organizations, states and tribes in order to find a better way of managing fish. Dams, overfishing, and development are among the reasons for a decline in Columbia Basin salmon and steelhead. Seventeen of these fish species are now federally protected as endangered or threatened. The National Oceanic and Atmospheric Administration, or NOAA, is the federal agency charged with coming up with a long-term plan to increase those fish populations and see that they can be sustained. NOAA is about to write that plan. That led to the agency sending a one page letter, addressed to more than 200 people and groups in the Northwest. "I think people are optimistic that we can go through this assessment, we'll get some new ideas, we'll get some expertise focused on the issue and maybe be able to chart a new course," says Barry Thom, the deputy regional administrator at NOAA and the letter's author. Thom says one reason NOAA is reaching out to the community is because there is so much going on in the Northwest to advance the scientific understanding of what these fish need to survive. "We are learning from the fish," he says. "We are learning from the science, we're learning from what interests and values are in the system and that's the piece that we want to pull together." NOAA just finished writing long-term plans for the Upper Columbia, Mid-Columbia and Willamette rivers. A draft plan is being finalized for the lower Columbia this year. The plan they are working on now is for the Snake River and it's listed salmon and steelhead species. The first of these plans were finished in 2006 and identify actions over the next three to 50 years. The assessment process is NOAA's way of exploring potential for integration for the entire Northwest. Thom says he hopes the plans give him a better picture of recovery across the landscape; more of an umbrella-type concept. The long-term recovery plans will likely be revised every five years in collaboration with the four Northwest states and the region's tribal governments. It's important to note, this long-term salmon recovery planning is separate from a parallel effort that's been in the works for 20 years. That is a planning process aimed at finding ways to operate dams without jeopardizing fish in the Columbia Basin. Each version of the plan has been challenged in court and subsequently reworked over the past twenty years. Trout Unlimited was involved in that case. It's one of the original 13 salmon advocates that challenged this plan in 1992. Robert Masonis from Trout Unlimited says his organization walked away last year from the legal conflict because it wants to seek a collaborative solution. "It's timely that NOAA has taken this step because it's something that we signaled last year when we stepped out of the litigation that we were interested in pursuing," Masonis says. Masonis says even if the salmon and steelhead discussion does become a collaborative effort, it could still take years of open negotiations before everyone agrees to a long-term recovery plan. 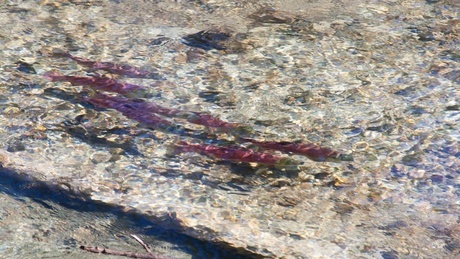 Feds Hope for Collaborative Effort on Salmon Long-Term Planning <-- Listen at original site.